Are we ready for Potty Training? How does one even know when they’re ready? We hit 23 months old this week. We’ve been talking about potties for about half that time. Our daughter sits on one (sometimes). So we’re ready for potty training, right? We started this girl in potty mode at 14 months. Well, kinda. We thought we were ready. 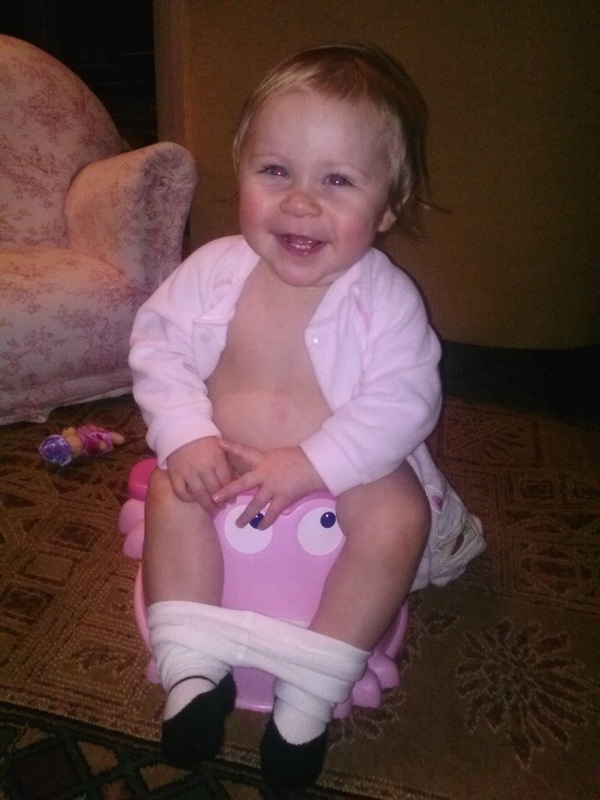 Things haven’t really been moving for us (no pun intended) so I’ve consulted “The ABC’s of Potty Training” by the BabyCenter Medical Advisory Board to see if we really are ready for potty training or if we’re jumping the gun. Because people have been mentioning “she’s ready for potty training!” for awhile now, and I’m not finding that to be the case. And other people are talking about potty training babies half our age. I’ve started to get the inkling that she’s ready for the potty, but I haven’t pushed anything or been consistent yet by any means. Can she follow simple instructions? Uhm…yes and no. Yes, she can if she wants to. No if she don’t. Can she walk and sit down? That’s like soooo 2013. Can she take her pants off and put them back on? She regularly strips herself naked unassisted…knocks over chairs and tables, puts riding trains and rocking horses on top of furniture…opens locked cabinets…and works the Ipad…I think it’d be no sweat. Then they say “Buy the Right Equipment”. Things tend to show up early and often around here with cousin hand-me-downs. And even if we’ve been too young to potty train, we’ve long had the means to keep up appearances and find uses for our potties. Which is easy when you’ve been given no less than six potty chairs, one cushy toilet seat, and your very own Little Bottom Line. And that’s how there’s been a potty chair in the kitchen and two more in the living room/playroom, and others around the house for MONTHS now. I finally did away with the one in the kitchen; too many close calls with hot food and bags of groceries. But it sat on top of my clothes dryer for a long time after that. And we’ve been tripping over, picking up, and vacuuming under the ones in the living room ever since. 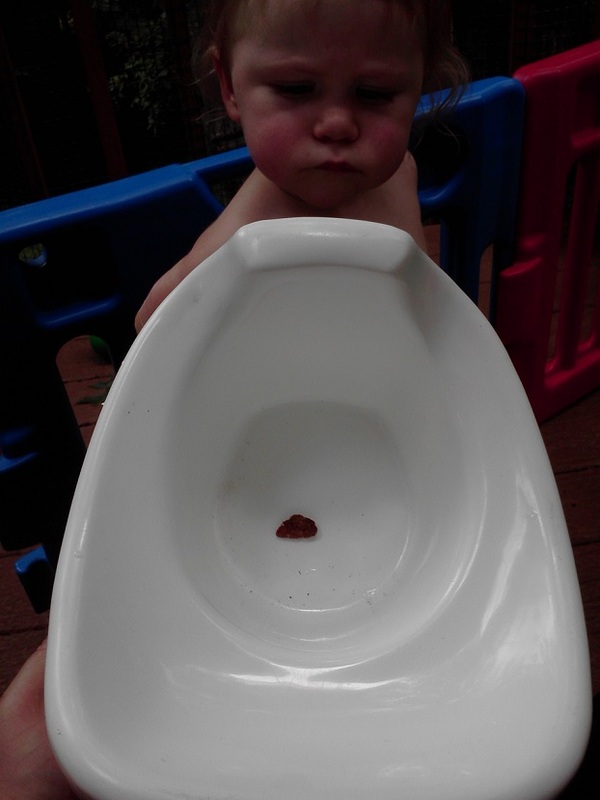 Some potty training experts call this “introducing the potty” and “making it available” but not forcing it. Introductions made. Equipment available. To and for our daughter, and anyone who’s come to visit in the last several months. 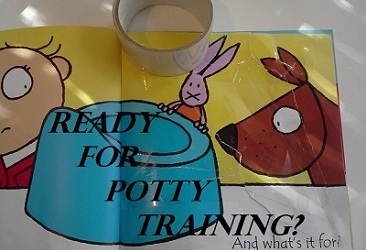 But does this mean we are we ready for potty training? Uhm…no. The potty décor is starting to get to me. I’m sick of looking at useless potties. I want all these potty chairs to mean something! The third step is “Create a Routine”. We should already have this one in the bag on the merit of my three year old niece alone. It’s a group adventure when she goes potty. She makes a poo poo (which we all look at) and then makes a “friend” for the poo poo (so it won’t be lonely). And sometimes she gets really motivated and makes “a family.” Everyone in the house oohs and ahs. And I dig in her overnight bag for gummy bears or make a panic-rummage through the kitchen for something to offer. Pooping is big business in our house. Muffin is completely absorbed in the process. She likes to be right up on the action. She gets behind the poofed up Frozen dress, to the back of the toilet where things are happening. She points, yells “Poo! Poo! Pee Pee!”, and offers tiny bunches of toilet paper. She’s an uninvited part of this routine several times a day, 3-5 days a week. So? Why aren’t we potty trained? Then they tell you to “Demonstrate for Your Child”. Again, check. I’ve had no privacy in the bathroom since my daughter started crawling and if I shut the door between us there’s h-e-double hockey sticks to pay. When she was younger it was her favorite time to demand feed. Now, mommy potty time is synonymous with needing a snuggle or a kissed boo boo. It is also a time when it becomes a dire necessity to wash hands (I’m never sure why it’s necessary for her in the first place but it instantly becomes necessary for me if I want to maintain sanity). And gut instinct has directed me (like probably most moms) to make the most of these teachable moments in potty training, I’m not sure they needed to put together a medical advisory board for that. I’m guessing parents all over the world teach their children the ABC’s of potty training just like this. Which goes in hand with the next ABC: Explain the Process of Potty Training. In this step the experts say it’s good to read up on potty training (with your child). 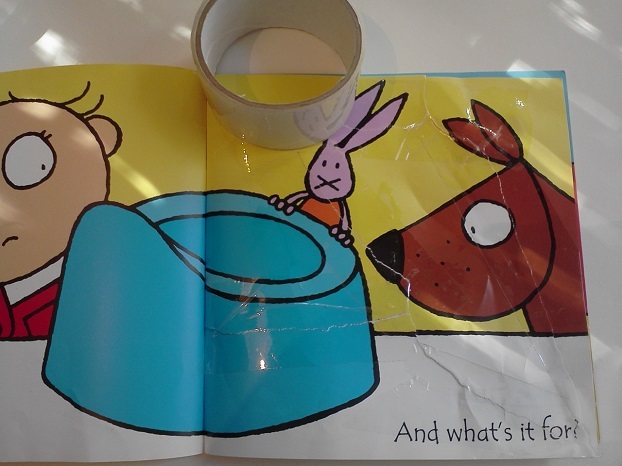 Books like: “Everyone Poops“, “Where’s the Poop?” and “Once Upon a Potty” none of which we have. Ours are made up of much more fascinating stuff: “The New Potty” and “Potty Time“. But I’ve found shortcuts. For instance, you can ditch the books beause there’s a lot to learn about pooping on YouTube (if you want to take the time to hook up an Ipad to your TV so others can do the work for you like I did, no shame). Besides, reading hasn’t always worked out for us and I wondered after today if maybe Muffin isn’t so partial to potty training after all. Is this her ever so subtle way of telling me? But we’re rocking it with the online tutorials. The next step in the potty training repertoire of tricks is where my potty training breaks down because it’s “Foster the Habit“. Well, wouldn’t most say it’s difficult to foster a habit you haven’t created, hmm? We did have what I call “The Tiny Poop Miracle” out on the deck back in June, when Muffin was 18 months old. I’m glad I took a picture because we haven’t seen anything like this since. But I would have been happy to make a habit of it. That being the case, we’d be well beyond tearing up potty training books. Habits aside, I’ve pretty much got the next three steps in hand, which are “Grab Some Training Pants“. Well, I did grab (and stock) about 350 of these but they don’t seem to miraculously jump down from the top of the closet and do anything for us. Which is mysterious to me. Next is “Handle Setbacks Gracefully“. Do you see anything ungraceful about the way I’m handling this? Er…don’t respond to that because you haven’t seen me trying to intercept a stream of urine that is pooling on the floor. And second to last, is “Introduce Night Training“. If we can learn to sleep through the night I’ll be happy, much more if we wake up dry. That sounds like a dream come true. And the final step is “Jump for Joy“. But I’ve already jumped (and squealed) for joy at the Tiny Poop Miracle. So the experts have confirmed it: If anyone should be fully potty trained before their 2nd birthday, it’s Muffin. We have a month before then and there’s all kinds of online information I’m looking into about How to Potty Train in a Week and How to Potty Train in 3 Days. We have nothing to lose since my “introducing” turned “total immersion” method hasn’t worked. And turning 23 months didn’t do the trick because I have the most informed and still-diapered child on the planet. When did you know your child was ready for potty training? Update: If you check out this post you’ll see that, two months later, we still aren’t ready.